During 2017, the Cromarty Medieval Burgh Community Archaeology Project was incredibly grateful to secure further funding from the Hunter Archaeological & Historical Trust, the Cromarty Trust and the Marc Fitch Fund. This enabled the project to complete post-excavation specialist work and install new interpretation next to the dig site! The works completed include artefact analysis by National Museums Scotland, ceramics analysis by George Haggarty and Derek Hall, animal / fish bone analysis/reporting by Triin Aadli and Laszlo Bartosiewicz, glass analysis by Robin Murdoch, stone tools analysis/reporting by Ann Clarke and botanical analysis/reporting by Jackaline Robertson. We are currently working on our popular publication - which will be available to the public, presenting a summary of the archaeologists' and specialists' interpretations, together with loads of images! We are grateful to a recent funding grant from the Cromarty Firth Port Authority for this! 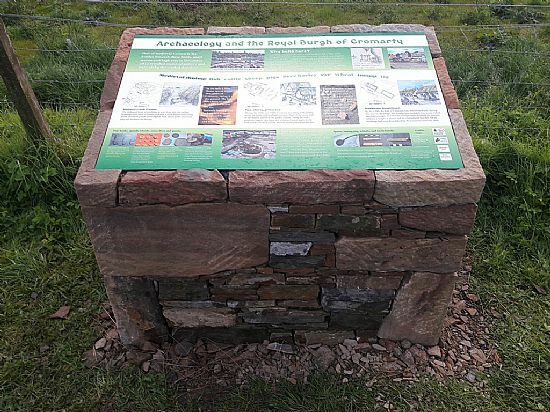 Finally, in case you missed it, the new interpretation panel is up next to the dig site on the popular Cromarty South Sutor footpath, with access into the site from the path to see the medieval well.